At the end of February, I got together with friends to explore the making of terrines and pates. Some were to be for the store cupboard and others were to be eaten right away. A recipe for rabbit terrine came from Simon Hopkinson’s book Roast Chicken and Other Stories; the recipe for perfect smoked mackerel pate came from Felicity Cloake; and from Jamie Oliver’s website came a recipe for pork rillons. We started our cooking session with the rillons, which we had planned to eat for our lunch. The pork belly had been cut up and salted the night before. After being rinsed and dried, the pieces went into a frying pan with a little lard, to be browned all over. The smell of the sizzling pork was wonderful!! The remaining ingredients for this dish had already been prepared. 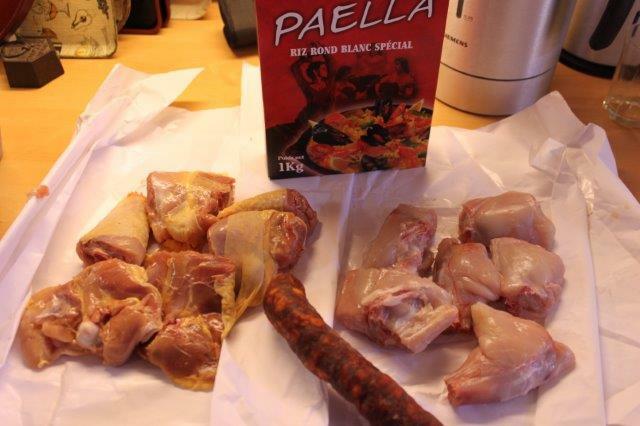 The browned pork cubes were put into an oven-proof dish, along with the herbs, the garlic, some lard and white wine. The dish went into the oven for an hour and a half! With the rillons out of the way, we started on the rabbit terrine. The recipe called for a small rabbit, pork back fat, skinless belly pork, pork fillet, bacon rashers, onion, garlic, butter, egg, herbs, breadcrumbs, cognac, salt and pepper – quite a list!! The butcher had already boned the rabbit, which was incredibly helpful! In his introduction to the recipe, Simon Hopkinson calls for all ingredients to be chopped by hand, as the resultingtexture is nicer. We chopped everything into small pieces, but the results were still a little too coarse for our liking. We chopped some of the meat using two very sharp knives – that worked fairly well! The hand-chopping took a lot of time and elbow-grease, so we put some of the meat through an old-fashioned meat grinder. The remaining ingredients were mixed with the chopped meat..
… and then we packed the mixture into terrine jars – the kind that seal with a clip and a rubber band. The terrines were put in a deep baking dish. Hot water was added to come halfway up the jars, and then the dish went into the oven for just over an hour. At that point, we were ready for a little aperitif!! After a few sips of vin d’orange, we made the perfect smoked mackerel pate. The recipe was very simple. Smoked mackerel fillets were skinned (and any remaining bones removed), then pureed in a food processor with cream cheese, creme fraiche, and horseradish. A few grinds of black pepper, some lemon juice and some chopped dill were folded in, and that was it! We ate the smoked mackerel pate with some toast – it was absolutely delicious and a perfect start to our meal!! The rillons were our main course. They had been filling the kitchen with the most delicious aromas for far too long!! We served them very simply, with a salad of ‘bitter’ leaves and blood oranges. The ‘bitter’ leaves were endive, chicory and radicchio. It was the perfect accompaniment to the rich taste of the pork. They were looking very good! Of course the jars would have to cool completely before the clips could be taken off, and then they would have to stand for a week or two for the flavour to develop fully. Prior to writing this, I opened a jar to taste it. The pate is absolutely delicious – well worth the effort, and definitely one to make again! The Chinese zodiac year of the Fire Rooster started on January 28, 2017. Together with a few friends I decided to welcome the year of the rooster, by cooking a Chinese meal. Our host had selected the dishes for us to cook and done all the shopping! The soup only required two ingredients which might not be in your cupboard: fish sauce and chili paste with garlic. You should be able to find both of them at an Asian grocery store or in the speciality section of a larger supermarket. The remaining ingredients are easy to find. The finished soup was delicious, wonderful flavours of ginger and lemongrass. Definitely one I will make again! Preparing that dish was fairly straightforward, but different to the classic way of using crispy duck. In this recipe, skinless duck breast was cut into strips, then stir fried and finished off with hoisin sauce. We decided to substitute lettuce leaves for the pancakes, which made the dish lighter and gave it a bit of a crunch. The king prawn and scallop stir fry required a fair amount of preparation, but it was very quick to cook! We substituted sherry for the rice wine, and there were some asparagus spears, so they went in as well! :). It tasted every bit as good as it looked! 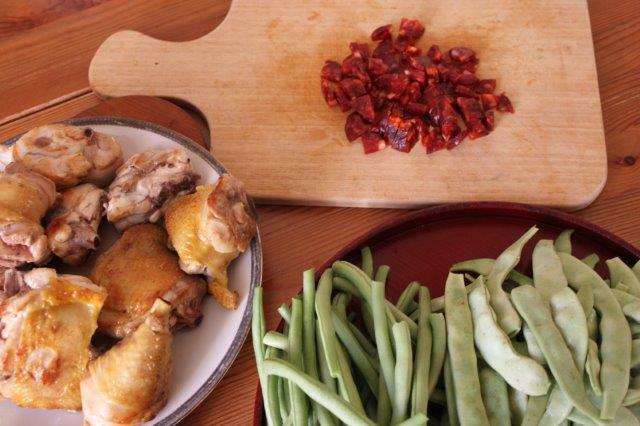 The chicken and cashew nut stir fry is an old favourite, which was easy to make. It was great in that it required no special ingredients. 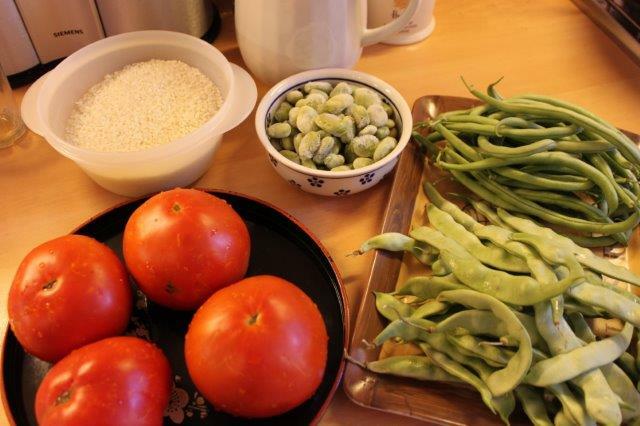 Once all the vegetables and ingredients were prepared, the cooking was very quick! Another delicious dish! We finished our celebratory meal with a light and refreshing dessert. It was a perfect ending to a delicious meal! The scallop dish was pretty easy to prepare. A mandolin slicer made very short work of shaving the fennel into wafer-thin slices! The shaved fennel was mixed with lemon juice and olive oil, and set aside while we made a dressing with honey, vinegar, saffron, orange juice, olive oil and a little lime juice. The scallops were looking beautifully plump! Once we were ready to sit down for our starter, the scallops were seared on both sides in a very hot frying pan. When they were just done, we arranged some of the dressed fennel and a few scallops on each plate, and drizzled over the prepared dressing – et voila!! Delicious and simple to prepare at the same time! The Bandari monkfish tails were prepared for our main course. There was one monkfish tail per person. To prepare this dish, the monkfish tails were marinated with a spice paste, which contained turmeric, curry powder, cumin, ground coriander seeds, cinnamon, garlic, fresh ginger, coriander leaves, dill weed, Greek yoghurt, and lime juice. Quite a list of ingredients!! Sabrina Ghayour recommended that a shirazi salad would be perfect to accompany the fish, so while the monkfish tails were marinating, we prepared that. The shirazi salad is a colourful mixture of fresh vegetables: cucumber, tomato and red onion, all cut into small pieces. Here’s the start of it. …and the finished dish tasted every bit as good as it looked! Originally we had planned to have our get together on Shrove Tuesday, also called pancake day in Britain, and so we had chosen crepes suzette for the dessert course. Unfortunately our get-together had to be postponed, but we stuck with the crepes suzette for dessert all the same. Wwe used Gordon Ramsay’s recipe (you can find it here), but we didn’t quite follow his method! First we made a stack of crepes (thin pancakes), which were covered in plastic wrap, to stop them from drying out. The oranges were filleted (the peel cut away, and the segments cut from the membranes), and some squeezed for juice. The sugar was caramelized in a stainless steel pan (please don’t ever use a non-stick pan for that purpose, the temperature is too high for the non-stick coating), and once it was a nice caramel colour, grand marnier liqueur was added and “flamed”. Careful, don’t singe your eyebrows! The orange juice was added next, and the whole left to bubble for a moment. Next the crepes were dipped into this sauce, one after the other, and each crepe folded into four. They were then arranged on the plates, and decorated with the orange segments. The crepes suzette were totally delicious! I wish there had been more!! Do you have a favourite cookbook or recipe you return to time and time again?? Do let me know!! A couple of weeks back, I published the 200th post on this blog!! To mark this milestone, I treated myself to a very special dinner at Nopi, whilst stopping over in London on a recent trip. Nopi is a restaurant which was created by Yotam Ottolenghi, amongst others. I’ve long been a fan of Mr Ottolenghi’s recipes, so this was very exciting!! Plenty more is the title of Yotam Ottolenghi’s fourth book. There’ll also be ‘plenty more’ posts on this blog! Since it was not long after Christmas and New Years, we all agreed that we wanted to keep it as simple and light as possible. The dishes we had chosen were perfect for that! Et voila, the finished dish! With the caramelised pears we substituted strained yoghurt for the mascarpone, and left out the fennel seed crackers – it was still a very delicious dessert!! It was such fun trying out these new dishes, and the results were so very good. Have you tried out any of the recipes from my blog? I’d love to hear how you got on! You might have guessed from the title – I’ve been enjoying the annual visit of friends who have a house in Saint-Chinian. We had some wonderful meals and days out, and together we have cooked and eaten a lot of delicious food!! 🙂 I don’t know how, but I did manage not to gain a huge amount of weight in the process – perhaps it was the hot weather!? On my cookery book shelf I have a book called Catalan Cuisine (Europe’s Last Great Culinary Secret) by Colman Andrews. 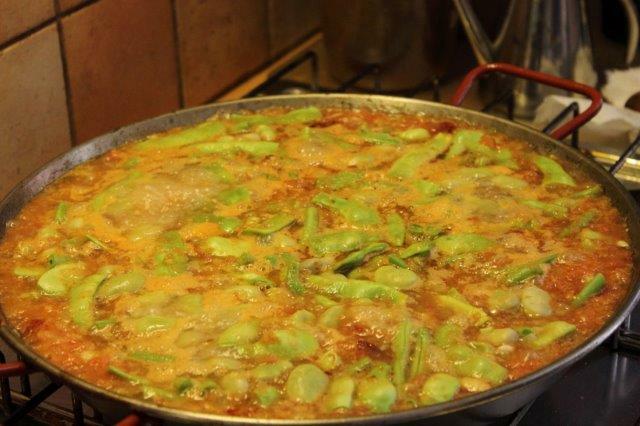 The author gives a number of recipes for Valencian paella, which is not strictly speaking a Catalan dish, but one which has been enthusiastically adopted by the people of Catalunya. 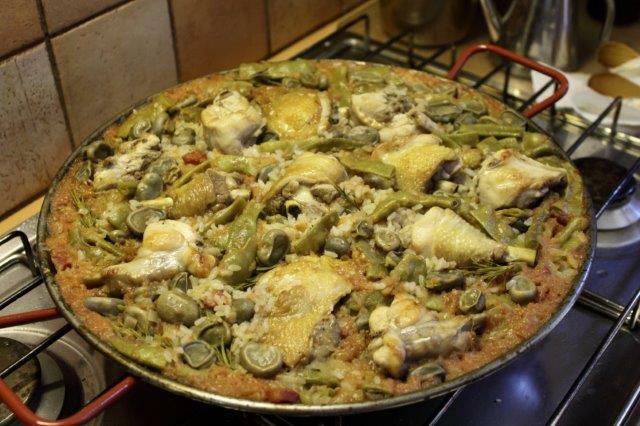 We decided to try the straightforward Valencian Paella, for which rabbit and chicken are used – no seafood here! 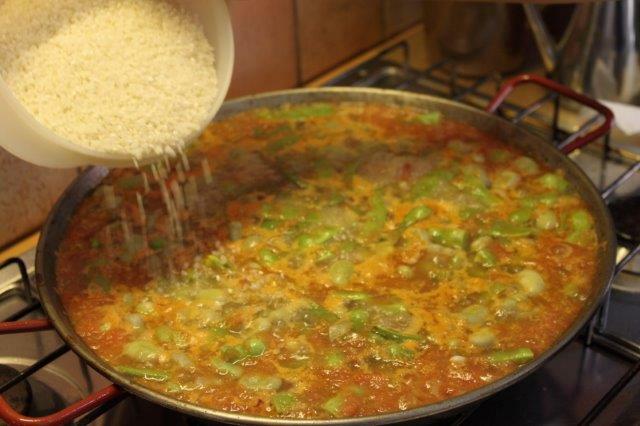 You can read an article by Colman Andrews about paella here – he also gives a recipe for a vegetable paella as part of the article. Our ingredients were 250g rabbit, cut into pieces by the butcher, and 750g chicken, also cut into pieces by the same butcher. I love my butcher in Saint-Chinian! I sometimes wonder what I’ll do when he retires! We also used some chorizo, which was not listed in the recipe, but we felt like it. 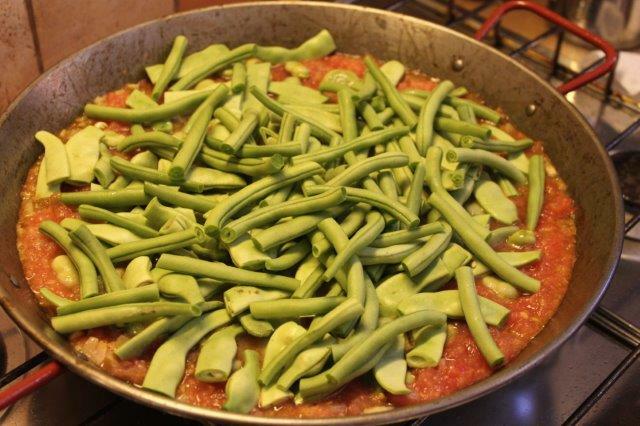 The recipe also called for one chopped onion, three tomatoes, olive oil, 500g of assorted beans (we used broad beans, French beans and a type of flat bean), a sprig of rosemary and 500g of short grain rice. We also made up 1.2 litres of chicken stock. 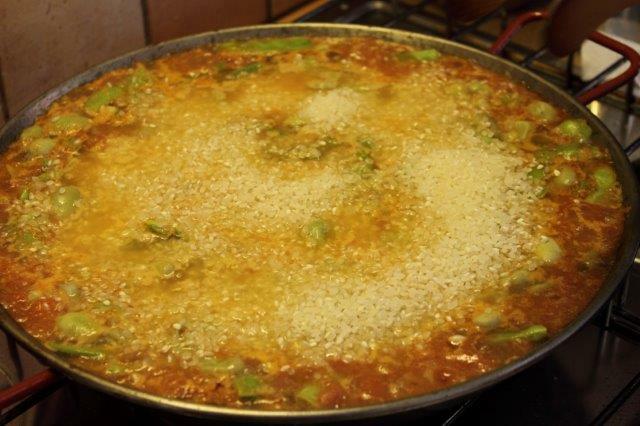 Paella seems to take its name from the dish in which it is cooked, although in Spain, outside of Catalan territory, the pan is called a paellera, and in Valencia the pan is called a caldero. I’m sure there are reasons for that!! 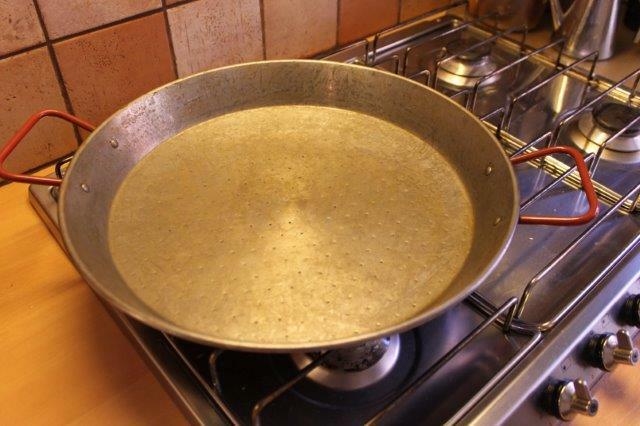 🙂 The pan is almost as important as the rice – it has to be wide and shallow, to allow the rice to cook through evenly. 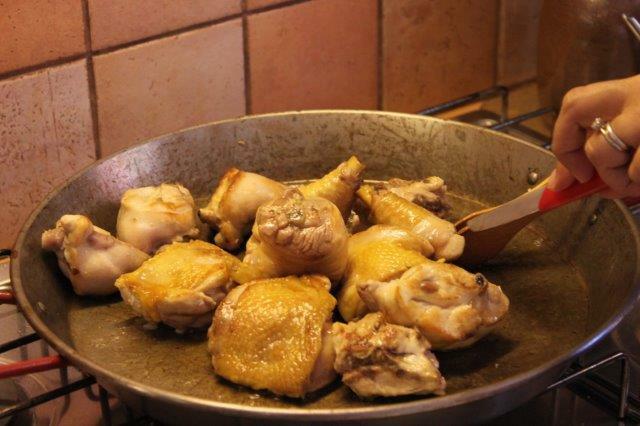 We started off the cooking by browning the rabbit and the chicken pieces in some olive oil. 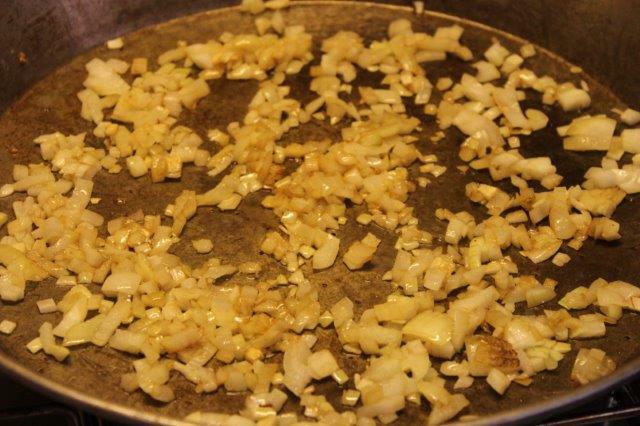 After the meat was nicely browned and had been removed from the pan, the chopped onion was added and cooked in the remaining fat until golden . 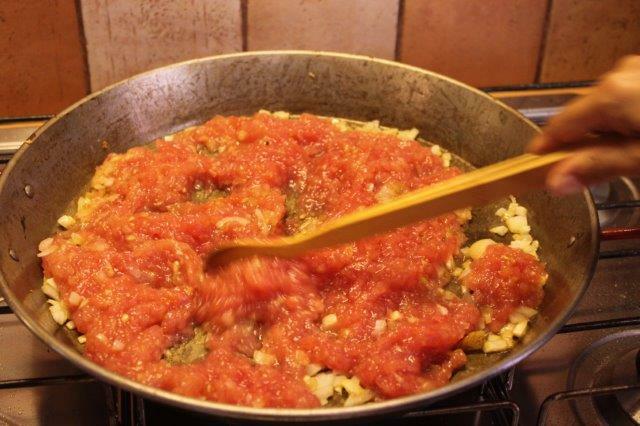 The tomatoes, which had been peeled, seeded and chopped, were added to the onions and cooked until they had softened. 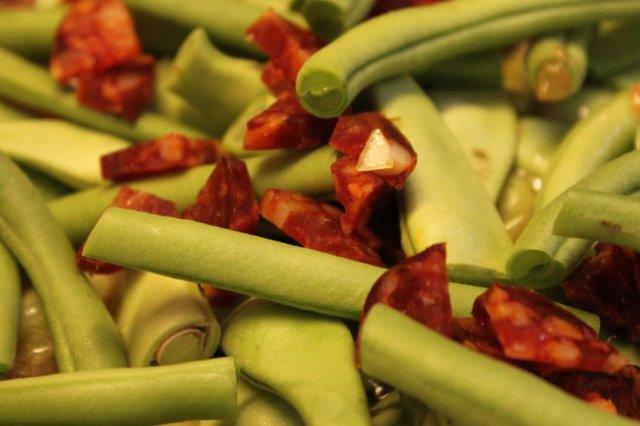 Meantime the beans and chorizo had been prepared. The meat and rosemary were tucked in, and the pan brought gently to the boil. Somehow we managed it without making an unholy mess all over the cooker! If you are going to try this at home, be sure to use gentle heat to avoid burning the rice. Once it had cooked for about 10 minutes. 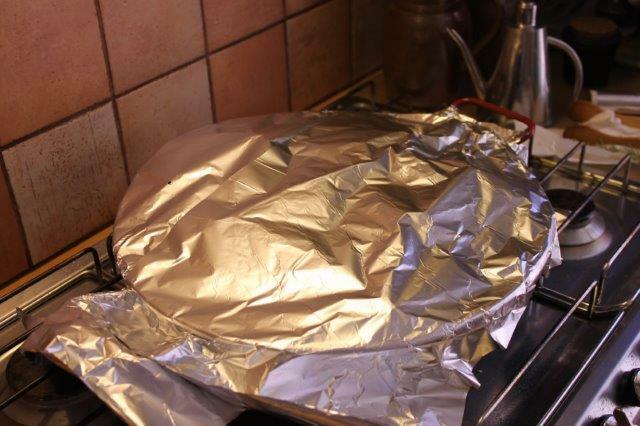 we covered the pan with aluminium foil and turned the heat to its lowest setting. Then we had a well-earned glass of wine while we waited!! The rice was perfectly cooked and the flavour was divine. The recipe notes stated the quantity to be enough for 6-8 as an appetizer and 4-6 as a main course. There were six of us, and despite our best efforts there were plenty of (delicious) leftovers! It was a truly wonderful dish, and one which I’ll be making again! !